Jamaican American reggae singer Tarrus Riley, 34, is fond of saying that reggae music is “the newest old music and the oldest new music.” At first, that’s a bit of a head-scratcher. But a listen to his new record, Love Situation, brings Riley’s meaning into focus. The son of reggae singer Jimmy Riley has risen to international acclaim on the heels of rootsy, pop-tinged hits such as 2007’s “She’s Royal” and last year’s “Gimme Likkle One Drop.” But his latest record is pure rocksteady, a precursor to reggae that developed in Jamaica in the mid-1960s. It’s a throwback, but one whose easy, organic sounds feel especially forward-thinking in an era smitten with electronic effects. By looking to the past, Riley is moving ahead, creating something new from something old. SEVEN DAYS: You’re known more for contemporary roots reggae, so why do a straight-up rocksteady record? TARRUS RILEY: I grew up around that kind of music, because of my parents. So it’s not that strange to me, you know? SD: But given the music that has made you well known, this is a departure. TR: It is. It’s something new. It’s a different style of singing. Dancehall is my generation, the music I grew up on. So to do a full-fledged rocksteady album is definitely stepping out of the box. But at the same time, I’m no stranger to this music. SD: Your father was a pretty famous singer, but when you started out, your music didn’t resemble his at all. The new album does. So is this a tribute to him? TR: My father is a different person, from a different time, with a different voice. But it’s funny that you say that, because this rocksteady stuff is closer to him. There is even a song on the album that he wrote, “Version of Love (My Story).” He didn’t sing lead on that originally, so the vocals are still my style. But that’s his style of music. SD: I gather love is the main theme of the album. TR: It’s all love stories. Rocksteady is lovers’ music, you know what I mean? So much so that in England they call rocksteady “lovers’ rock.” So it’s different kinds of love stories, getting together music, breakup music, burning desire. That’s the basic theme of it. SD: Are they love stories from your own life? It’s real and it’s very sincere. It’s feel-good music, you know? I think we could use some feel-good music, and I think music should make people feel good. So I wanted to do that, which I think I’ve done. SD: You’ve given an interesting quote in several interviews: “Reggae is the newest old music and the oldest new music.” What does that mean? TR: The reason I say that is, if you think of reggae music, of Jamaican music, it has vintage roots. It comes from slavery, Nyabinghi drumming. The king of the music, Bob Marley, he left us at 36 years old, and he was still young. So that music is still young. Reggae music comes from an ancient time, but it’s still brand new. 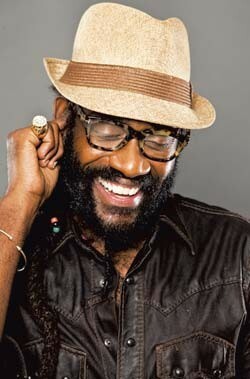 Tarrus Riley is a youth, but I’m playing ancient music. So it is old and it is new. And that’s why a lot of people think I’m older than I am. You feel me? SD: Did your dad give you any advice about the music business? TR: Make sure I get paid. SD: [Laughs] That’s good advice. TR: It really is. He told me that in the music business there are a lot of ways to get paid. But if you’re not careful, you’ll work a lot and not be compensated the right way. So love it, and it’s OK to love it. But make sure you get paid. Good advice! SD: A lot folks would say that getting paid for music is becoming harder and harder. Do you agree? TR: Not really. You just have to know how to do it and be aggressive. TR: Yes, but not like a rock disc jockey. That gets twisted around on the internet. I was a dancehall DJ like the people I idolize, like Shabba Ranks. SD: Right, as in toasting. Do you still do it? TR: Some. But I think you hear the DJ vibe more in my singing, the rhythm, the tempo. Some singers tend to be laid back, singing behind the beat. I try to incorporate what I used to do as a DJ into what I do as a singer. It gives me a different kind of vibe. So DJing helped me create a sound, a Tarrus Riley sound. SD: You went back to the rocksteady era for your latest album. Any chance you’ll go back even further in time and make a ska record? TR: I actually started something like that. Once again, ska is the new old music, because it has roots from all over the place. And I have a few ska songs I’ve written that might turn into an album. It’s really cool music, and I think very modern, even though it’s old. The original print version of this article was headlined "Something Old, Something New"